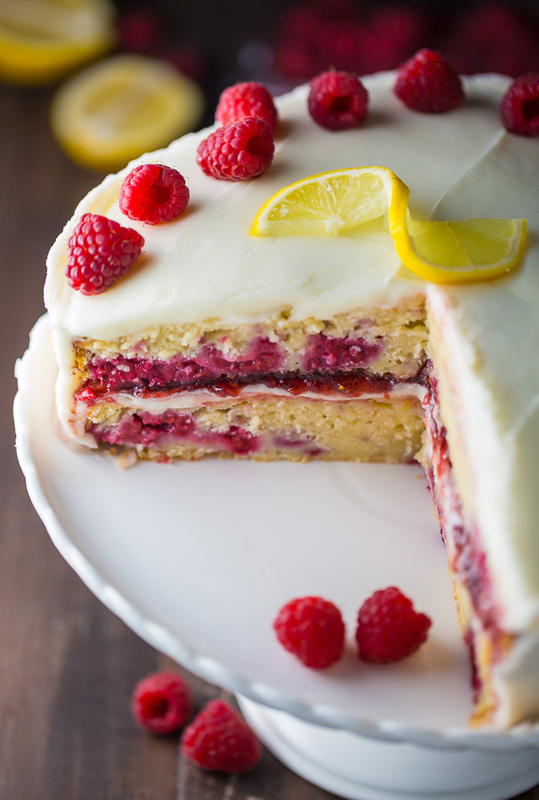 If you like lemons and raspberries you’re going to LOVE this Lemon Raspberry Cake! This raspberry cake is exploding with fresh lemon flavor and covered in tangy lemon cream cheese frosting. It’s the perfect lemon raspberry dessert for Mother’s Day or Easter brunch! Last week we had 3 straight days of crazy rain and I barely left the house. I happily accepted the less than stellar weather as an opportunity to nest. I treated myself to delivery (twice! ), curled up on the couch for a serious Criminal Minds marathon, and baked until there was no sugar left in the pantry. It was during these shenanigans this Lemon Raspberry Cake came to be. I’ve been taking advantage of Summer berries in a major way. Every weekend you can find me at our local farmer’s market, swiping up as many cartons as I can carry. Last weekend the raspberries looked especially plump and lovely so I splurged and bought 6 cartons!!! 3 to eat, 3 to bake with. Summer life is the best, I tell ya! This recipe calls for cake flour. Cake flour is extra finely ground and gives our cake it’s silky soft texture. In most grocery stores you can find cake flour in the baking aisle. If you can’t find it – don’t fret! Making your own cake flour is easy, and only requires two ingredients: cornstarch and all-purpose flour. Here’s what you do: For every 1 cup of flour called for in the recipe, remove 2 Tbsp of flour. Then add in 2 Tbsp of Cornstarch for every 1 cup of flour (you’re replacing the tablespoons of flour taken out with cornstarch). Sift this mixture a few times (you want it well combined) and that’s it – you just made ready-to-use cake flour. I list lemon extract as an optional ingredient. If you prefer a cake with light lemon flavor, I do not think it’s an essential ingredient. If you prefer a very lemony cake, I highly suggest adding the extract to both the lemon raspberry cake batter as well as the frosting. I love Watkins pure lemon extract because it’s 100% natural, doesn’t contain any artificial flavors, colors, or additives, and just tastes like pure lemon. I promise I’m not getting paid a cent to say any of that; I just really love their lemon extract! If you’d like your cake to look exactly like mine does in these photos, simply top it with fresh raspberries and twisted lemon slices. 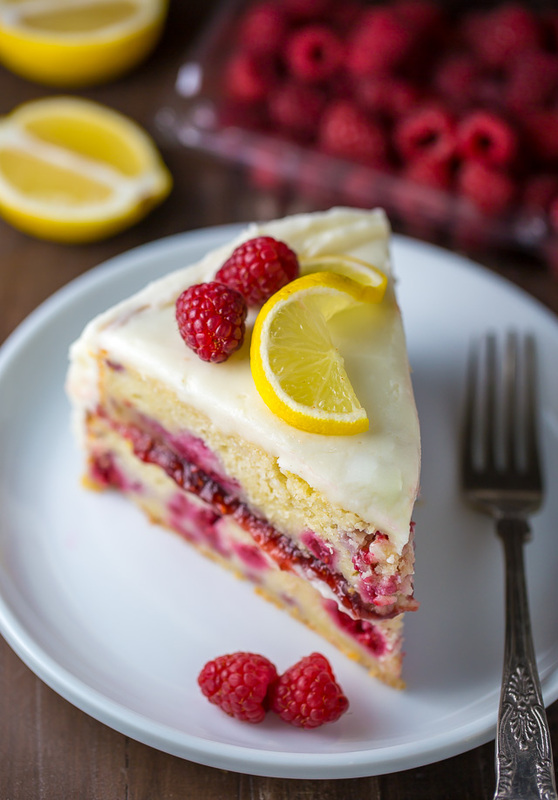 Don’t let the Summer slip by without baking this lemon raspberry cake! 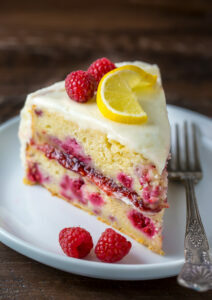 Ultra moist and flavorful Lemon Raspberry Cake! In a large bowl using a handheld electric mixer (or in the bowl of a stand mixer fitted with the paddle attachment), combine the butter, both sugars, lemon zest, lemon extract, and vanilla extract; beat on medium speed, scraping down the sides of the bowl as needed, until light and fluffy, about 5 minutes (don't skimp on time here!). Add in the eggs, one at a time, beating well after each addition, and scraping down the sides of the bowl as needed. Set aside. In a separate bowl, whisk together the cake flour, baking powder, baking soda and salt, mixing well to evenly combine the ingredients. Add the dry mixture into the wet ingredients and mix on low speed until everything is just barely combined. You should still see some lumps and dry streaks. Turn mixer off. Add in the milk, sour cream, and lemon juice; use a rubber spatula to fold the ingredients into the mixture, stirring until everything is incorporated, but being sure not to overmix. Set aside. 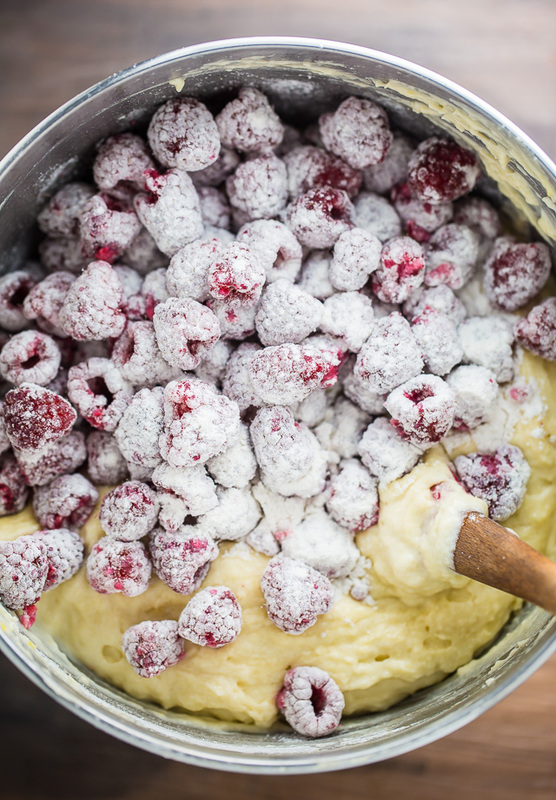 In another bowl, gently toss the raspberries with 2 tablespoons of all-purpose flour. Add the raspberries, and any remaining flour, to the batter and fold in by hand, using a rubber spatula, until just combined. Again, be sure not to over mix! Over mixing is very easy to do, and will result in a dry, dense cake. In a large bowl using a handheld electric mixer (or a stand mixer fitted with the paddle attachment) beat the cream cheese and butter on medium-speed until light and fluffy, about 3 minutes, scraping down the sides of the bowl as needed. Reduce the speed to low and gradually add in the confectioners' sugar. Add in lemon zest, lemon juice, lemon extract, and salt; beat until combined. Increase the speed back to medium and mix until creamy, about 2 minutes. Add the sour cream and continue beating the frosting until very light and fluffy, about 2-3 minutes. If the frosting seems too thin, add a little more confectioners' sugar, starting with one tablespoon at a time; if the frosting seems to thick, add in a little more sour cream, starting one tablespoon at a time. When the cakes have completely cooled, place one round on a cake stand or large plate; spread the top and sides evenly with frosting, then top with the raspberry preserves. Don't worry if they mix together a little. Gently place the other cake round on top of the frosted one and press down very lightly to seal them together. Place the semi-frosted cake in the fridge for 20 minutes, then continue frosting the cake, using a thin spatula, offset spatula, or whatever you have that works best, until the top and sides of the cake are evenly frosted. Place the cake back in the fridge for another 20 minutes before decorating. I love decorating this cake with fresh raspberries and thin lemon slices, but feel free to decorate according to your own tastes. Be sure not to pack your cake flour when measuring. Be sure to bring all cold ingredients to room temperature.The frosted cake will stay fresh, when stored in the refrigerator, for 3 days. This cake is absolutely amazing and beautiful. I can’t wait to make it. thanks so much for sharing this! I will share it too! Hi! i was just wondering wether the frosting works to hold fondant in place for a birthday or a special event in case i want to use this receipe! Hi, has anyone tried this with fondant? Just wondering whether to cover the cake with fondant before adding fondant decorations, or if they can be added directly onto the frosting… Thanks! Does the Lemon Raspberry Cake freeze? I was wondering if it would be suitable to try out for my wedding cake. The recipe looks like just what I want.. I want to hang out and have a criminal minds marathon while EATING this cake. Deal? The filling looks so amazing! I love when lemon and raspberry are paired together, they taste so good together! That looks delicious, I would love a piece of it right now! I love your flavour combinations. Thanks for sharing. Looks delicious! Can’t wait to try it. Do you think I would have to use the same amount of flour if I use glutenfree flour? Hi Bianca. I have very little experience baking with gluten free flour, so I can’t say what the ratio would be for this cake. I believe if you’re using cup-for-cup gluten free flour the amounts would be the same. Thanks so much! I will try that! Absolutely a scrumptious cake.. Now tops the list of my fave cakes! Made it for the first time for visitors. Gutsy move but successful! Thank you bakerbynature for this awesome recipe! This looks amazing! Can it be made in a bundt pan too? If so what how long would the cooking time change? This cake is INCREDIBLE! I made it for a friend’s birthday and everyone LOVED it! My new go to fabulous cake. Thank you for sharing. Hi, does the cake get much rise other than what is shown here? Attempting in couple of days for hubby bday party so want to check further, it looks very moist pound cake like. Is that what I should aim or light airy? Hi Roopa. The cakes will rise just enough to get a slight dome. It’s subtle! The cakes will be moist but dense enough to slice. How would I change the recipe to make cupcakes? Made it yesterday. It was just a delight on this first snowfall day. This cake is a winner and a keeper in our top recipes collection. Full fat tastes better and existing research shows your better off going for full fat dairy. I made this cake yesterday. I didn’t have enough lemon nor the raspberry preserves, so decided to halve the recipe and just make it one layer. The taste is fantastic! Even though I halved the frosting, it was more than enough. It seems a little sweeter than necessary so when I make this again — definitely making this again! — I will not use as much powdered sugar in the frosting. I usually use the low fat version of sour cream and cream cheese, however, I see you specify full fat, why is that a must? What would the effect be suing the lower fat? Do not want to make it with all therse ingredients to see it fail. This cake looks amazing, and I want to make it. Thank you for your time. I made this cake yesterday for my boyfriend’s birthday! I’m not a big fan of sweets so it was slightly too sweet for me but it was good nonetheless. Also, i must’ve over stirred because it was quite dense. (I know, I know, I was warned!). Anyway my boyfriend loved it and that’s what counts! I sprinkled some left over grated lemon peel on top and it had a really pretty finish. Thank you for the recipe! You’re so welcome, Mary 🙂 Glad your boyfriend loved it and you enjoyed it, too! Oh my goodness this cake took me FOREVER to make. I followed the instructions to a tee but it came out flat as a pancake 🙁 I still put it together and iced it and hopefully it will taste ok for my sister’s bday tomorrow. I will let u know with an update! Hi! I’m ready to try this amazing lookinh recipe, just wondering if I can refrigerate my cake layers for 1 day? Will they be just as good if I assemble tomorrow? I followed your recipe for my son’s 1st birthday party, and I was quite proud of it. Everyone loved it! And I loved the way you placed the lemon on top, I did the same. This recipe is too yummy-looking to ignore. I’m looking forward to making one of this myself. Thanks! Do you think white chocolate ganache woukd work with this cake too? Absolutely a keeper! Always looking for that perfect berry cake since we grow way too many raspberries & marionberries here in Western Washington. I followed the recipe to a tee, and it turned out perfect! Berries did NOT sink to bottom of cake! Delicious! A thing of beauty! Also made the lemon cream cheese frosting. Definitely will make it again and again! It will be my summer company cake!! And my fall cake . I did use frozen raspberries but as the recipe said, I did not let them thaw, and the cake was perfect. Thank you for this phenomenal cake!! I Just made this cake for my mother’s 65th birthday. I loved it and I think everyone else did too. I actually doubled the frosting recipe and made my own raspberry filling since store bought preserves tend to be sweeter. I posted a picture online and several people asked for the recipe. This comment made my day, Charissa! So happy it was a hit, and Happy (belated) birthday to your Mom! Love this! My cake turned out great! Thank you so much for posting this recipe! Regarding the cake mixture alone & not the frosting, what kind of butter should I use? Unsalted butter or regular salted butter? Awesome! i love this red color and pinky cake. It would be a great gifts for our beloved ones. Thanks for the amazing recipe. Is it possible to use two square 9 inch pans instead of round? I made this cake for Easter and now am making it for my dear son’s 24th birthday at his request. Love love the light cake. It even turned him into a raspberry preserve lover! That is a major conversion. I’m going to make a gluten free version for those in the family that are sensitive. Thank you for sharing! It is on the most requested list in our family. Tried it and my family loved it! Thank you for the amazing recipe!!! Every year, my mom asks for a lemon raspberry cake for her birthday. This cake, was by the far the best one we’ve tired! Everyone wanted seconds and some friends even took it home for breakfast! I did have to bake it for about ten extra minutes, but that is because my oven bakes a little strangely in the summer. I made this for my moms bday celebration. It was a HUGE it! In fact everyone voted to bring it to every get together! *i added lemon juice to the raspberry preserves donut wasn’t too sweet with the frosting. Awesome recipe. Thanks for sharing !! Delicious cake with a great lemony flavor. I used lemon extract as recommended. Frosting is really sweet, so I didn’t use that much. Cake came out great and looked just like the pictures. Thank you ! This cake was a hit! I’m now getting requests to make it. This was Wonderful! I made it without the frosting, and served it with cream for dessert at a family get-together. It looked fabulous and everyone loved it. I’ll definitely be making this again. I’m in UK, does •1/4 light brown sugar, packed, mean 1/4 CUP light brown sugar? and packed is when you push it down? Can I use 1 9inch tin and cut the cake in half? How long would you suggest putting it in the oven for if I do this? I just made mine in one 3” deep 9” round pan. I didn’t keep track but I think it was at least an hour I had to bake it. It’s cooling now, so hopefully it lives up to its reputation. I’m going to throw it I. The freezer for a bit so it’s easier to torte. This cake looks delicious! I Luv anything raspberry and lemon. Wanting to make it for a get-together but would be easier to serve if in a 9×13 pan and cut up into smaller squares for the kids . 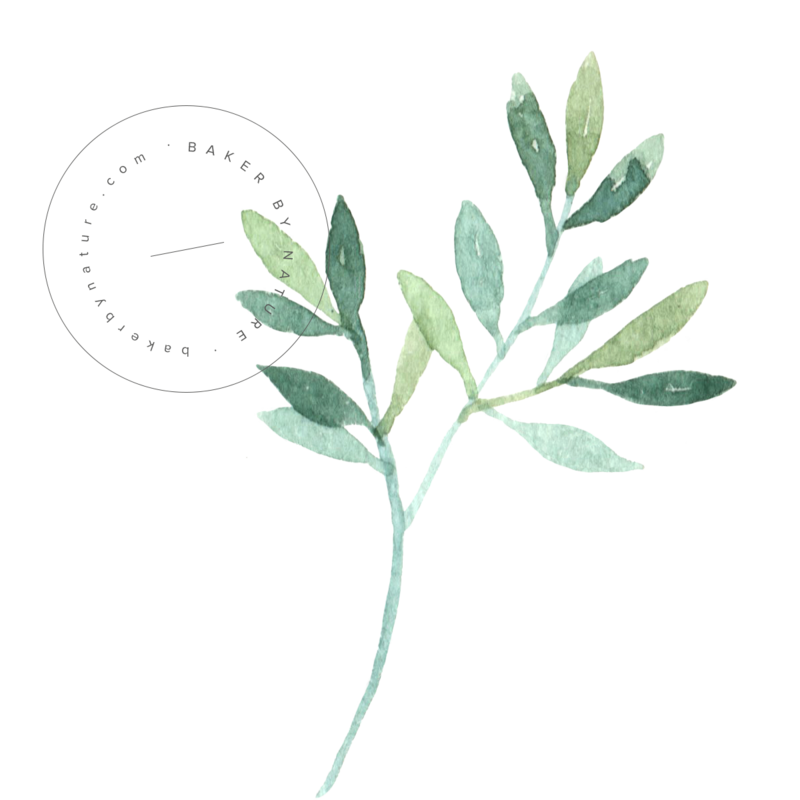 Is it possible to make this in a 9×13 pan? If so, how long do I bake it for? Thanks for the recipe. I’m wondering the same thing! Want to make it Friday for my daughter’s birthday. I made this cake tonight. A couple things, especially for beginners…. as a complete novice (this was my first homemade cake) this recipe was really hard to follow the correct way. We don’t KNOW how to cream things like butter, or the proper way to incorporate dry and moist ingredients together, or whether to use unsalted or salted butter. I ended up using salted because it never specified. Maybe that’s why my butter and sugar didn’t cream at all after more than 5 minutes with my kitchen-aid mixer, besides the fact that I just dumped it all in there and turned it on. The cakes still looks presentable… I haven’t tasted it yet… but really, either give a disclaimer about the process or put every detail into the recipes please. I still plan on making it again =) it was just annoying to have to keep looking up videos on what things should look like and how to do certain steps. Hi Emily. I’m glad you enjoyed the recipe! And I’m sorry you had trouble following the recipe. I do have notes in the recipe on how you should cream the butter (beat on medium speed, scraping down the sides of the bowl as needed, until light and fluffy, about 5 minutes) as well as how to incorporate the dry ingredients (Add the dry mixture into the wet ingredients and mix on low speed until everything is just barely combined. You should still see some lumps and dry streaks.). Has anyone tried this in a bundt pan yet? Can’t wait to try it! Sorry I meant shelf life!! Thank you for sharing. This looks amazing. This cake is absolutely fantastic! my daughter made this for someone’s birthday and the cake was the life of the party! 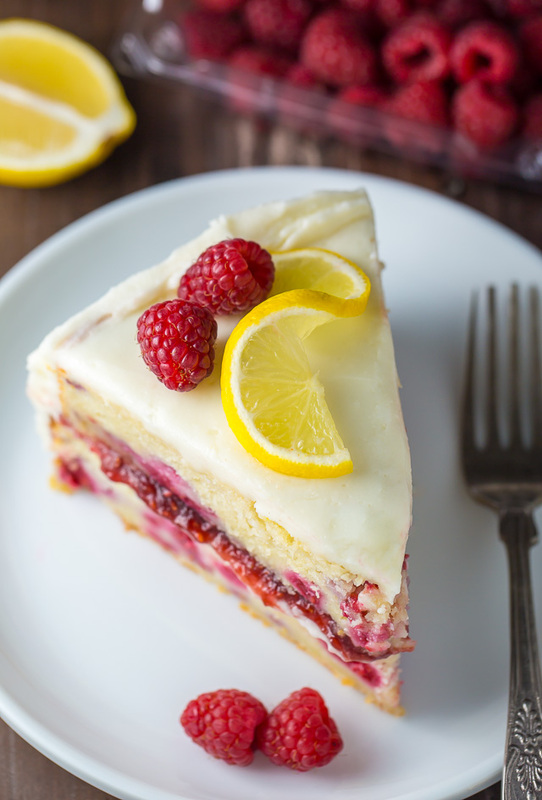 I was wondering if you could substitute the raspberry and lemon for something different let me know I am definitely looking forward to making another delicious cake! Made this cake for my daughter’s 21st birthday, as she requested something with raspberry and lemon. I was so happy to find this recipe . Followed it exactly as written, including using the lemon extract in both the cake and the frosting. The cake turned out just like the photo, i.e., BEAUTIFUL!! The cake was SO moist, and SO delicious (past tense, because her birthday was yesterday, and the cake is totally gone already!). The tartness of the lemon and raspberry balanced out the sweetness of the cake perfectly, and the fresh flavors and colors were such a welcome treat in the middle of winter. The cream cheese frosting was rich and decadent without being too sweet. My only comment is that I ended up with about twice as much frosting as I actually needed and sadly had to throw out the extra. I will definitely be making this cake again soon! Looks great and I can’t wait to make this. Wondering if it is possible to make the cake layers ahead of time and freeze for a few days before taking them out to ice? I usually do this with my cakes so that I am not rushed but haven’t done it with cakes that have fresh fruit in them. I need for an event on a weekend and with the shelf life of 3 days, this may be a problem if I need to bake early in the week. Thanks! I’d like to do the same thing. Have you tried it? hello- I am really looking forward to making this cake for my husband. I have been reading through all of the previous comments, I will keep them in mind, ie, unsalted butter, room temp items, not to over mix. I am looking forward to making it!!! This cake turned out amazing!! Delicious lemony perfection. My daughter requested a lemon raspberry cake for her 9th birthday. Typically when I make cakes, I like to stick the base recipes I’m familiar with and modify them slightly. This time I decided to try something new and I’m SO glad I did! My daughter (and other adult guests) were so impressed and thought it was store-bought. The only change I made was that I increased all ingredients by 150% and made a three tier cake. It worked perfectly and was gorgeous!! This cake is amazing! Thank you for sharing it with us! P.S. I recommend using homemade raspberry preserves. It’s a very sweet cake and needs the balance. Typically store-bought ones are very sweet. Making for Easter on Sunday. Can I make it on Friday afternoon/evening and will it be good until Sunday? Your photo of this cake sold me! I,like some others who have commented, wanted to make the cake on Friday for Easter dinner on Sunday. It is wrapped and in the freezer now. Fingers crossed for tomorrow!! Plus, it came out of the oven looking so amazingly delicious that the freezer is the only place to keep it where I will stay out of it! Lemon & Raspberries, two of my most favorite things. Followed the recipe exactly- except I used 3-6” round pans instead of 2-9” pans. Baked according to directions, took about 43 minutes. Definitely a denser cake then I’m used to, but it was moist. Wish I had fresh raspberries to decorate the iced cake with, but all the stores were sold out so I ended up piping rosettes to dress up the cake for Easter Dessert. It was a huge hit! I made this cake the other week and absolutely loved it. I wanted to make it again, but this time for a co-worker’s birthday. So instead of bringing a cake into the office I was thinking about turning this cake into cupcake for instead. Do you think that’s possible? How long would they bake for? I made this cake yesterday and it turned out absolutely delicious! 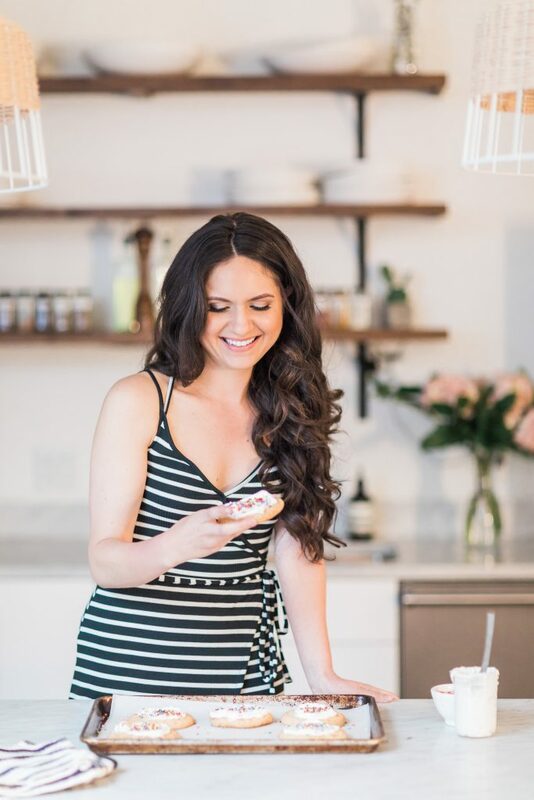 I made the following substitutions because of some guests dietary restrictions and they worked perfectly! Made a simple buttercream with 2-3 T unsweetened vanilla almond milk, 1 stick unsalted butter, 3.5 cups powdered sugar, and 1/3 cup raspberry preserves and a pinch of salt. I made this cake for my daughters first birthday party. To say it was a hit would be an understatement. I followed the recipe to a tee (just omitting the lemon extract) and it came out perfectly. 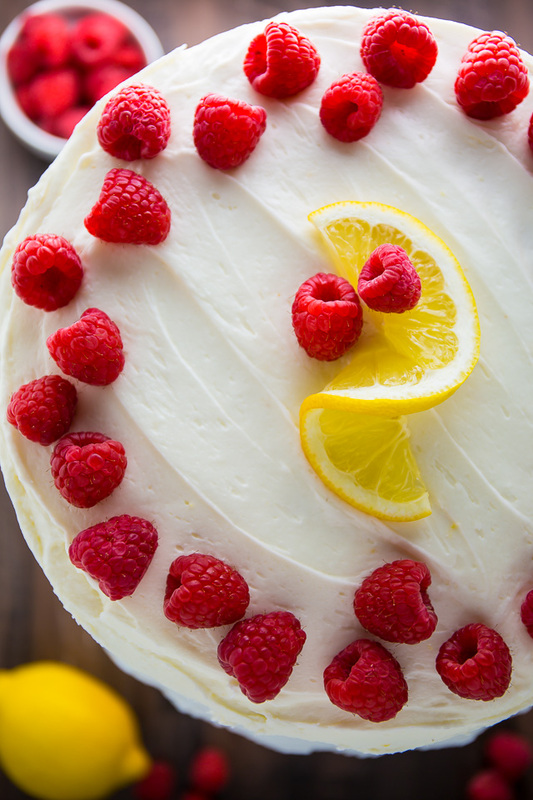 The fresh lemon really balances out the sweetness of the raspberries and the frosting. Definitely will be making this cake again. Everyone could not stop raving about it. Absolutely delicious! I baked this cake for my mother’s bday. I did not have two cake pans of the same size so I baked it in one pan and skipped the rasberry jam. Big success. Worked fine. Had some icing left over for homemade muffins. Icing is very good. I used this recipe today – but made cupcakes instead – wow, just wow. My family can’t get enough of this recipe, it’s to die for! I also added blueberries to the mix for the sake of adding color. Can’t wait to use more of your recipes! Amazing! Great recipe, awesome Flavor. It was a huge hit. Will definitely re-make it. Do you have metric conversions for this recipe? I find it’s much easier to use the right amount of ingredients if I weigh them on a scale. Help please! I really want to make this cake for my baby shower!! I have just made the cake and I can’t wait to try it. The only thing I struggle with is the amount of sugar in the cream. What other option can I use that won’t require that much sugar? I’ve tried to cut it by half and use gelatin to thicken but it’s not working. Personally I just don’t like the taste of sugar in that concentration. With that being said, the cream I made right now is tasty but runny obviously as I keep praying for the gelatin to work . Thanks for this recipe. You need to reduce the amount of liquid to the frosting. This cake was wonderful. I followed the recipe exactly but made it as a sheet cake. Frosted the cake with the icing then spread the preserves almost to the edge. (I did not put preserves in the middle as I was afraid of ruining the 13″x9″ cake while trying to slice it through the middle.) I then piped frosting around the edge to cover the edges of the preserves. Made it for a party and people I didn’t even know said it was the best cake they’ve ever had! Will definitely be making this many more times! Hi Carla…I want to make this cake in a 9X 13 pan too…can you tell me about how much longer or less time wise I need to bake it than if I used the 2 9″rounds? Hello, this recipe looks awesome. I want to try it but what is the 1/4 light brown sugar, packed? Thank you…. I was wondering if it was a cup or teaspoon also! I made this exactly per the recipe with the one exception of dialing back the sugar and upping the lemon in the frosting. It looked EXACTLY like the pictures and tasted exactly as I hoped. Swanky bakery quality!!! Thank you!! This cake is absolutely fantastic!! I made it for the first time for my mother-in-laws 80th birthday party. Everyone loved it. There was not one piece left over, so I am making another one just for my family today. I made this for my mother’s birthday and now whenever I’m discussing a dessert I should make she suggests this. As a joke, but seriously. I liked that you could actually taste both raspberry and lemon. I have been making cakes most of my adult life, including wedding cakes — one of which was lemon and rasberry. So I was excited to see this recipe and made it today for a birthday celebration. I have to say, I really struggled with this! It took a long time to make (much longer than the 20-60 minutes mentioned) and the cake just didn’t seem to be baking through. In fact, after I removed them from the pans, I saw raw spots on the bottom so returned them to the oven sans pans and upside down to bake further. I kept coming back to this site to read the comments to see what I may have done wrong. This is not an inexpensive cake to make but I was almost ready to throw in the towel and head to the bakery. But I forged ahead and just made apologies to the group that, with the amount of fruit, I wasn’t sure that the cake had baked through. Well, I’ll tell you — just like most of these comments here — everyone LOVED it!!! Loved. It. Yes, it was dense and, yes, undercooked in spots, but folks went nuts over it!! I’ll definitely make this again but will need to figure out why the cakes did not cook through. A wonderful surprise ending to a somewhat stressful baking day. I seriously could have written this exact comment. Baking history and all. The bake was very stressful and I was not confident that the finished product would be suitable. Luckily I found this comment and proceeded onward with decorating and filling the cake. I did this for a baby shower. I made a 9″ 3 layer cake with cheese cake filling between the layers(per request of mommy to be) and man it was a HUGE hit. My picky brother in law who usually let’s me know if a recipe is too sweet, dry, dense, ect.. was beyond belief. Nothing but praises from all the party. Thank you for such a great recipe! And all the comments for helping me through a hard night of baking! Turned out great! My 12 year old and I made it for her birthday. We did over stir just slightly but otherwise it was delicious. I made this cake this morning. It is a delicious cake. It did take some time. A lot more than the 1 hr. But I did enjoy the cake and so did my friends! I substituted raspberries with strawberries and it turned out wonderful! I kind of want to try this recipe again and add blueberries to the lemon! Thank you so much for the perfect summer cake! I followed this recipe to a T and it was absolute PERFECTION. This is an elegant summer dessert and will blow your dinner guests away! Thank you very much for sharing this Recipe. It was indeed a very lovely moist yummy cake. I made this and though it wasn’t as pretty as yours, damn was it good. I used the kitchen aid. Thank goodness bc it took time. Lots of it for the batter and esp the frosting which was the most perfect frosting I have ever made thanks to you. It was a huge hit. Def don’t use bottled lemon joins. Use fresh. I didn’t use the essence and it was perfect. I also used fresh raspberries. Again it was tdf. Thank you! I made this for a birthday earlier this year and everyone loved it. Do you think it would work to do chocolate rather than lemon and change it to a chocolate decadence cake? I have a Kitchenaid mixer that does not have a paddle attachment. Can I use the regular beaters? I keep telling people I am not a baker &, sadly,my results usually back up this claim. However I may have to give this a try just to eat myself! I can’t tell you how many times I’ve made this cake. It’s amazing!! Thank you❤️. I may try to make into cupcakes. Could you suggest a time to bake for cupcakes? Thanks for sharing, the flavor of this cake is amazing. One thing I want to point out, the steps do not include when to add the lemon juice, milk or sour cream to the cake batter so I added it to the other wet ingredients before adding the dry (between steps 2 and 3). I don’t know if this will change the density because I tried to not over stir and it was still pretty dense. When do you add them and what consistency should you mix to? Hi! Thanks for the recipe! It tasted good, at least I think so. Question. Does the texture of this cake change over time? I felt like it got kind of chewy the longer it was refrigerated. I made this cake and I used the frozen raspberries, my cake was a gross purple/pink color. But it does taste great. And the lemon icing is addicting. I wish it would have turned out better looking but my family loves it. I also put candied lemon peels on top as a garnish instead of scrapping the lemons I juiced. Overall a great cake. I definitely recommend it. I made this cake for Christmas dessert. It tasted great but was very heavy and dense. I thought I followed the recipe but was not light & fluffy. Where did I go wrong? Made this cake up for my husband who didn’t know if he wanted a lemon cake or a berry tart for his Birthday, so obviously I combined the 2 and made this wonderful raspberry lemon cake. It’s just the two of us so I halved the recipe and used two small round 5″ pans. I accidentally thawed my raspberries so I hurried up and threw them in the freezer for an hour, drained them, floured them, and they stayed put in the cake (no sinking, yay!). I also totally forgot to buy raspberry preserves so I took the juice from the frozen/half thawed berries, stole some fresh berries from the garnish/topping pile, threw them on the stove top with some confectioners until boiled, threw it in the freezer to thicken even more and wallah! So good. I think my favorite part of this recipe was the lemon frosting and the incorporation of sour cream with not only the mix but the frosting also. It made everything so fluffy and dialed down the over sweetness of the sugar, berries, and lemon. I wish i could share pictures, I’ve never been so proud of a cake before. It turned out picture perfect, I had zero issues with this recipe. If i could give it more than 5 stars I would! THANK YOU! This turned out great. As good as the stew i did yesterday. I sent a pic but Instagram isnt my strong point……..looking forward to eating it tonight after dinner. I followed this recipe to a tee!! It was tedious and came out amazing!!!! People could not believe it was homemade…..I wish I could post a Pic!!! Loved it, came out perfect! Thank you for such detailed instructions! I made it for my husbands birthday and it looks exactly like yours. Delicious. I’ve made this twice so far! I’m making it tonight for the 3rd time at my daughters request for her birthday cake. That’s a huge compliment. This is one of the only cakes I prefer cold. It’s like a dreamy flavorful cheesecake. Thanks for such a great recipe. It’s a keeper. I made this cake for the first time today, following the instructions and was quite pleased with the first attempt! I usually need to do fine tuning after a first try, overall I was very happy with the results. The cake (I had to make my own cake flour) came it great, used my home grown raspberries (frozen) and a local raspberry jam. My only comment was the icing. I ended up with far more than necessary and it wasn’t lemony enough by a long shot for me. I added like two small lemon’s juice and at least twice the lemon rind to get the flavor I was after. Next time I’d cut down on the sugar by a good 30%. So other than needing to change the icing recipe by adding a lot more lemon this recipe is a real winner! I made this for a co-workers birthday and it was a huge hit. It turned out perfect following your ingredients and instructions exactly. It was so moist and delicious. Looking forward to making it again. Beautiful, wish I could post a photo! I made it for a bake sale and it went within 10min! Only comment is that there is too much batter for two tiers, overflowed into my oven. Luckily I was watching, immediately took them out and distributed into a third pan. I followed the ingredients exactly. Can this icing be piped?